ClearLock is a free software which can lock computer, keeping the screen visible to you. It’s a lightweight and handy application which you can use to easily lock your computer. When you lock your computer using ClearLock, you are not able to give input to the computer, but you can clearly see the things happening on your screen. If you are running a long program which you want to see, but don’t want anyone else to interrupt that, then you can run ClearLock to lock your computer. Why should I use ClearLock to Lock Computer? You may have those naughty children or pets at home who keeps disturbing you all the time by unnecessarily pressing keys on your keyboard and buttons on mouse. When you can’t escape from an abrupt key press, it’s always better to lock your computer. Windows provide a default “Win+L” option to lock computer, but that actually locks your computer screen and takes you out of your desktop to the login window. This prevents you from seeing whatever was running on your system. ClearLock provides a better way to lock your computer. It locks your computer transparently. That means, you can lock your computer while keeping an eye on all the programs that are currently running on your system. Locking your computer this way actually disables any input to the system unless a specific password is entered, but allows you to see through your desktop screen. Extremely useful while watching movies, downloading files, or installing an applications which are generally time-consuming. How Can I Lock my Computer using ClearLock? ClearLock is very easy to use. It does not need any installation. You just have to download and extract the zip file, and run the application. Lets see how can we use ClearLock to Lock Computer. Run the Executable File: Once you extract the zip file you can run the application by clicking on the executable file. This is a portable file which you can keep anywhere on your system. Set Password: The first time you run the application, ClearLock will ask you to enter and confirm a password of your choice. This is the password which you have to enter every time you are going to unlock your computer. Enter a password and press “Save” button. Lock Computer: When you press the Save button, ClearLock will lock your computer. This will happen only for the first time. From next time you can just run the application and lock your computer directly. Unlock Computer: As you lock your computer, you will see a message box on your screen saying “Your Computer is Locked. Enter Password to Continue”. You can unlock your computer by entering the correct password. The box will disappear automatically after few minutes. You can see through the transparent lock screen and view all programs which are currently running on your desktop. My Screen is Blocked. What Should I do? ClearLock gives you three chances to enter the correct password to unlock your computer. 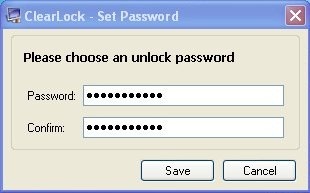 If you enter wrong password every time, ClearLock will block your screen and you will not be able to enter password anymore. In such situation, open the task manager by pressing “CTRL+ALT+DEL” and end the CLearLock program from there. Next time you run the application, you can continue with your old password again. ClearLock is a good application which can be used to lock computer while keeping the screen visible. The only thing you need to keep in mind is that it’s not a security software which can keep your data safe from others. It just prevents your computer from taking unwanted input, still allowing you to see what is happening on your desktop screen. Similar application we reviewed earlier is KeyFreeze.